Surface Plasmon Resonance is a phenomenon that occurs when polarized light hits a metal film at the interface of media with different refractive indices. SPR techniques excite and detect collective oscillations of free electrons (known as surface plasmons) via the Kretschmann configuration, in which light is focused onto a metal film through a glass prism and the subsequent reflection is detected (Fig. 1). FIG. 1 A light is incident upon a metal film through a prism and the reflected beam is collected and analyzed. At a certain incident angle (or resonance angle), the plasmons are set to resonate with light, resulting in absorption of light at that angle. This creates a dark line in the reflected beam shown in figure 2. FIG. 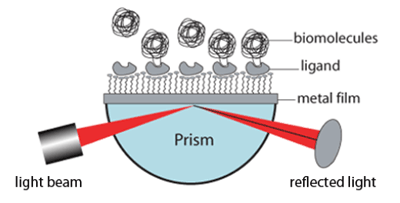 2 The excitation of surface plasmons results in a dark line in the reflected beam, and the angular position of the dark line shifts as a molecule binding event takes place. That dark line contains a wealth of information. 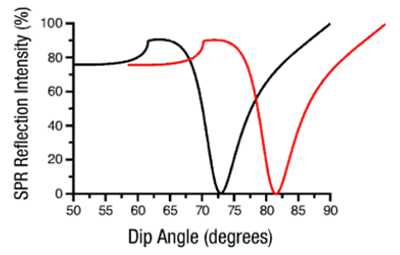 The resonance angle can be obtained by observing a dip in SPR reflection intensity. A shift in the reflectivity curve (Fig. 3) represents a molecular binding event taking place on or near the metal film, or a conformational change in the molecules bound to the film. By monitoring this shift vs. time, researchers can study molecular binding events and binding kinetics without the hassle of labels (Fig. 4). FIG. 3 SPR Scanning Angle Response. SPR causes an intensity dip in the reflected light at the sensor surface. A shift in the curve represents molecular binding. FIG. 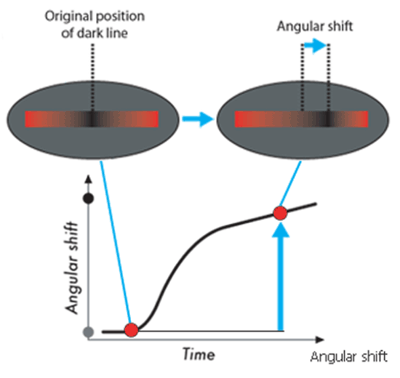 4 The angular shift vs. time provides a good study of binding kinetics. The reverse process, molecular dissociation, can be studied in a similar way.